The in-line beam picker type SLB-P is designed for removing feathers from carcasses of waterfowl as well as for picking turkeys in the slaughtering process. The beam picker is a free-standing device, which does not require any foundation work on the floor. It is made mostly from stainless, acid-resistant materials. Some elements of the picking head are made of aluminium. 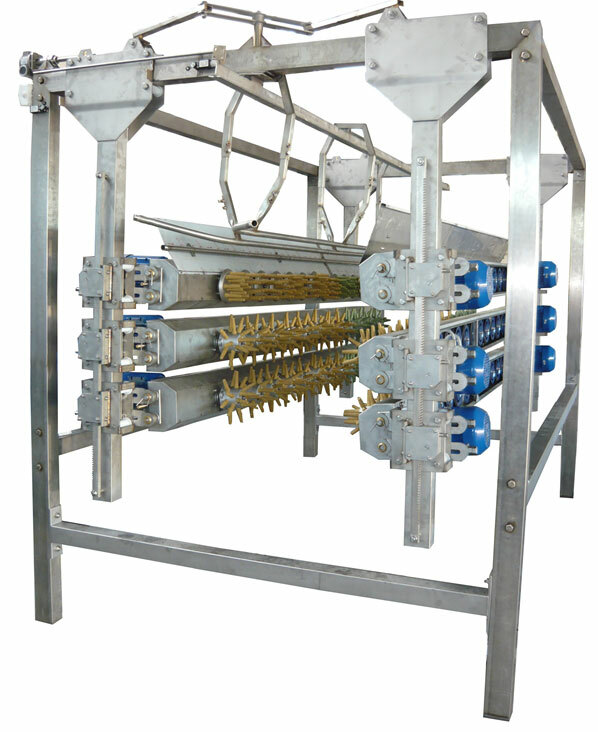 The basic components of the machine are: frame with 4 poles, 3 beams per each side – hung symmetrically from 2 poles. Horizontal adjustment of spacing between beams is done with the use of a system of levers and a manually or electrically-driven worm gear. Vertical adjustment of beams mounted to the poles is done with the use of worm gears and a vertical toothed bar, which are mounted to the poles (there are 3 gears per bar). Birds suspended in shackles of the chain conveyor, are introduced between the rotating picking disks. Both the angle of the beams and distance between rubber fingers and the birds are adjustable.